This book has a timely arrival on the bookshelves, since the withdrawal of legal aid for the vast majority of family law cases more and more people now in a position where they have little option but to represent themselves in family proceedings; the need for good, factual and accessible help has never been more essential. The book is well set out and covers the main issues that are likely to arise in chronological order of the events people are likely to face, chapter by chapter. Each chapter is neatly broken down into small sections, with clear explanations of the various stages and useful templates for court documents and statements. The style and layout of the book, and each chapter, makes the information much more accessible, and easy to find. The relevant legislation is well referenced through-out, and there is useful signposting to support/information groups and professional organisations. There is a balanced and common-sense approach to all matters; a healthy emphasis on out-of-court resolution and mediation. The closing “do’s and don’ts” with each chapter provide a useful checklist for the reader. The book has a very useful chapter on cohabitation and what remedies are available to unmarried couples, an area which is often not expanded upon in any detail in other self-help guides. 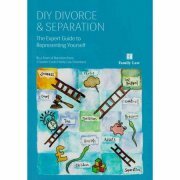 An essential and affordable book for anyone facing divorce or separation, and especially those who are self-representing. Also useful for those with legal representation as a better understanding of the proceedings will actually help you save money on legal bills. The information in the book will educate and empower the reader whether they are a litigant in person or represented. Q - What inspired you and the other authors to write this book? A - Primarily we wanted to help litigants in person who have to go through the dual trauma of family breakdown and then having to represent themselves in court. Our aim was to distil our inside knowledge as family barristers into a readily accessible guide. Our inspiration was to try to provide the reader with the tools and ethos necessary to maximise the chances of achieving a successful outcome. Q - What is your least/most favourite part of the writing process? My favourite part of the writing process is pressing the send button and dispatching the finished draft to the publishers! The most difficult aspect of the writing process was trying to convey sometimes quite difficult legal issues in easily digestible terms for non-lawyers. Q - What was the hardest part of writing this book? By far and away the hardest part of the production of the book was the editorial stage and blending the different contributions into a book that spoke with one voice. Q - How do you find or make time to write? I am afraid that the only thing that can give is free time. Q - Do you have any advice for other writers who may be thinking of writing books on/guides to family law aimed at LiPs? Emphasise the practical over and above pure legal theory. Q - How did the collaborative writing process work? Authors were allocated chapters or parts of chapters to write and we additionally had a team of editors who turned the individual contributions into a book. Meetings were easy to arrange since we were all members of the same chambers at 1 Garden Court. Q - And finally….what do you read for pleasure? The last book I read was Lamentation by C.J. Sansom. It is a wonderful book about a fictional barrister caught up in the intrigues of the Tudor Court.